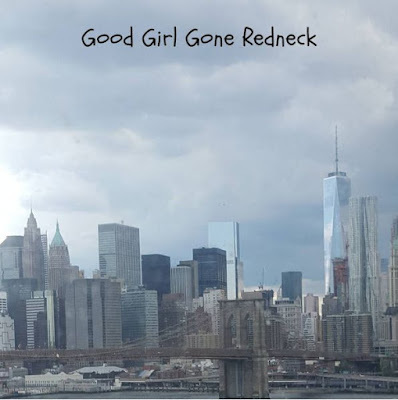 Good Girl Gone Redneck: My New York. My New York is made up of pizzerias, movie theaters and malls. It's made up of hot and sweaty subways, overheated stations and tellers who can barely hear you, but still smile. It's filled with pretzel vendors, ice cream trucks and a bodega on every other corner. You'll find flags flying proudly off of tall buildings, small houses and the backs of trucks. There are crystal clear blue skies and cloudy, stormy, gloomy days. Umbrellas poking you and blowing back from gusts of wind - secret wind tunnels between big buildings. It's the scent of beer, chestnuts, horses, or quite possibly freshly cleaned clothes wafting up into the street as you pass. Sketch artists ready to draw your face. Diners with breakfast 24 hours a day. Kids on the train singing loudly tryin' to make a buck. People annoyed by the intrusion of their solitude, but generous enough to dole out a few cents because they, too, found themselves bopping to the music. Books flopping in the hands of sleeping commuters. Headphones. Minimal eye contact. The occasional smile. Suits and skirts and sneakers and flip flops. Dirty feet after a ride on the summer subway or from pounding the pavement on a hot day. The sound of the train overhead on the elevated platform. Cars driving by with loud music. Mister Softee from around the block. Fruit stands on the corner with some of the best fruit you'll find anywhere. Sneakers hanging from telephone wires. Long concrete staircases just to get inside the house. Checking lotto every single day. My New York is home. Every year at this time I remember it. I think of being there. Of the long walk uptown. I can see the shoes I was wearing that day. Long gone now. I remember the chills I felt when the second tower fell. How so much of my New York had faded right then and there. I remember my last contact with my not-yet-husband as his building was being evacuated. And talking to my mom. And walking with a friend for a long, long time. And finally catching one of the first trains home to Astoria. Practically falling into my not-yet-husband's arms. Heartbroken. And laying on my bed as I looked out my window and cried. I remember being upset the next day that the flag at McDonald's wasn't at half-mast. And how I didn't go back to work for a while. And how things were when I did. Most of all I remember the shock, the pain, the sadness. The lives lost. The skyline forever changed in memoriam. These days I think of the helpers. So many of them. The smoke and ashes filling their lungs. And I send thoughts of healing and whispers of prayer. For all they did for us then - I say thank you. And yet I know that's not enough. So I vow to always remember. To teach my daughter how beyond what some bad people did that day, there were so many good people. So many helpers. So so many. Because that's my New York.